What is language? It’s more than just the words that we say, it’s the way that we communicate with each other, and it involves so much more than syllables and sentences. Early on, children don’t always understand the words that are spoken, but tone and pitch make a huge impression. The first person that your child communicates with is you. Children learn language and speech from their primary caregivers. But remember, it’s not about how many words your child can say, it’s about communication, which is a road that runs both from the child to the parent and from the parent to the child. Psychotherapist Julie Wright explains that children gain language best when parents are tuned into their needs and present in the moment. Speech is like any other skill that we must master in life, it takes practice. The more your child is exposed to language through your intentional communication, the more masterful your child will become at communicating. One method that often confuses parents is whether the use of baby sign language will delay language development. However, baby sign language instructor Heather Ellington states that teaching your child baby sign language actually bolsters language acquisition. Research shows that teaching sign language to babies before they learn to talk helps them to better communicate with caregivers. Remember that all forms of communication are part of language development. Pediatrician Dr. Sonya Sethi Gohill also explains that reading is one of the best ways to help your child learn a language. Reading offers you the opportunity to engage with your child and language specifically. When you read to your child, even when they are very small, they are processing that language and incorporating it into their experience of human communication. Words that you might not normally use in conversation, come forward during reading offering your child an expanded vocabulary. And don’t just read the words on the page, be an active reader to your young child. Ask questions and answer them. Point to the pictures, and take your child’s hand and point their little fingers towards the pictures as you read. Wait for responses, responding to your child’s verbal and nonverbal communication. Does your little one raise his eyebrows when you indicate a certain animal? Maybe he smiles whenever you say a certain word. Notice and acknowledge the stream of information that your child is providing you. Speak to them often and explain this new world to their hungry minds. Make opportunities to expose your child to spoken language. The greater level of interaction, the more depth of language your child will possess. Not just for now, but for a lifetime. Our son has been starting to speak more and more and it is really exciting! Kids learn speech in their own time. If you do sense they may be experiencing some sort delay it's always good to talk to their pediatrician about it. 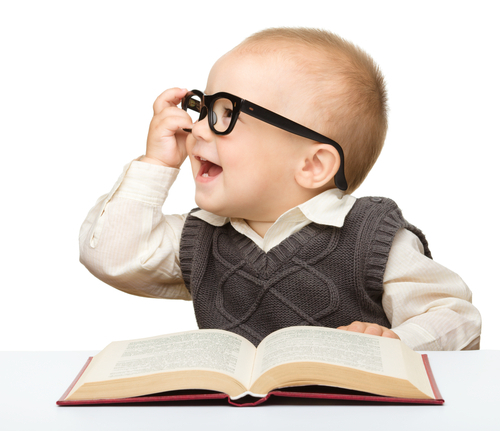 I think that reading with your child is a great way to help speech and language develop!